Published: 01:58 Wednesday - July 27, 2016 Mong village is not only an eco-tourist destination but also a cultural destination in Hua La, Son La. 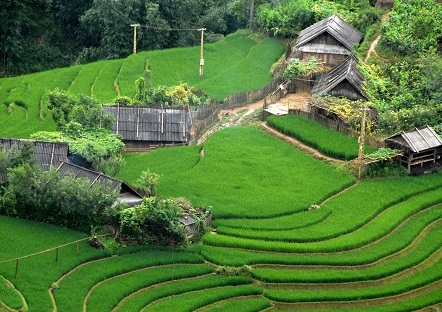 Mong village attracts people by the charming of mountains, green forest and the romantic river. Upon their arrival at the village, tourists will immediately notice the distinctive scenery constituted of spectacular mountains and rivers. The mountains of different sizes form a stunning range that resembles a dragon embracing the Nam La River. Coffee trees, pine trees, plum trees, apricot trees and bamboos cover the sides of the mountains. 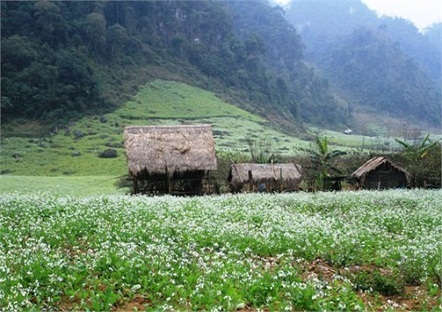 The village is also surrounded by primitive forests full of precious trees and colorful orchid flowers. Every time the spring comes, apricot flowers, plum flowers and Ban flowers show off their beauty, competing with one another to dominate the picture of forest. In addition, the yellow bees fly around, dancing cheerfully on the bed of flowers and adding to the brilliant scenery of Mong Village. It is not to mistake that the village will become tranquil and gloomy in the winter. In fact, winter is a perfect time for Vong Gai flowers to bloom, filling the forest with a bright red color. Feeling the winter breeze in the air while immersing yourself in the hot spring tub and looking at the red stilt houses and Vong Gai flowers will surely be something that you remember forever. 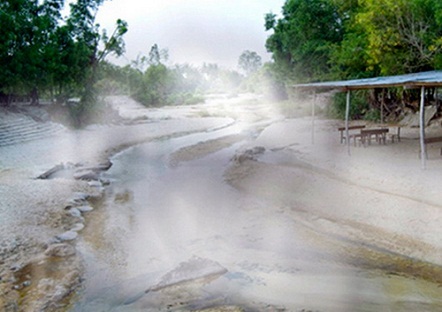 Moreover, there’s here a naturally hot-water stream called Bó Nặm Ún. It’s good for medical services. The village has 106 households of Thai minority and villagers live mainly on brocade-weaving forgery, pottery… The traditional cultural values of Thai ethnic group as costumes, jewelry, cuisine, festivals, folk dances and songs ... have been kept intactly. Mong Village also attracts tourists by abundant hot mineral water resource. According to scientists, average temperature of the outdoor hot mineral stream in Mong Village is 38oC. Water is colorless, odorless with physical, chemical characteristics and natural mineral components which appropriate with treating some diseases of skin, rheumatism, neuropathology, cardiovascular... In particular, water temperature changes to seasons. In the winter, water is warmer than in the summer. 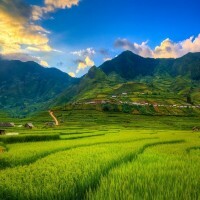 Staying in Mong Village, tourists will have the opportunity to admire, purchase textile, brocade products made by the villagers; especially enjoy many local specialties as cay pinh (grilled chicken), pa pinh top (grilled fish), forest vegetables, sticky rice.